The FA Cup trophy (file pic). 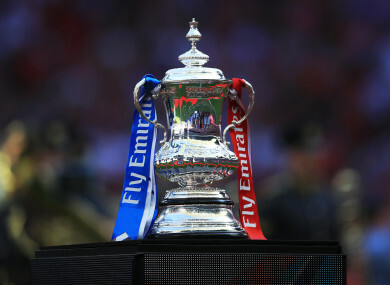 ARSENAL VERSUS MANCHESTER United is the standout fixture in the fourth round of the FA Cup, with the Premier League rivals set to meet at the Emirates in just under three weeks’ time. Holders Chelsea have been drawn at home to either Sheffield Wednesday or Luton Town, while Tottenham travel to Crystal Palace in another all-Premier League clash in the last sixteen. Liverpool exited the competition on Monday night at Molineux, losing 2-1 to Wolves thanks to a sublime Rubin Neves strike from 30 yards, with Nuno Espírito Santo’s men now set to face either Shrewsbury or Stoke City. Carlow striker Padraig Amond was the FA Cup hero for Newport County yesterday, with the 30-year-old former Sligo Rovers and Shamrock Rovers player scoring an 85th-minute penalty to knock out Leicester City. His side will travel to face Middlesborough in the next round, while Ireland trio Shaun Williams, Aiden O’Brien and Alex Pearce will welcome Everton to The Den as the Premier League outfit travel away to face Millwall. All games take place across the weekend of the 25th-28th of January. Email “Arsenal and Man United set to face off in the fourth round of the FA Cup”. Feedback on “Arsenal and Man United set to face off in the fourth round of the FA Cup”.